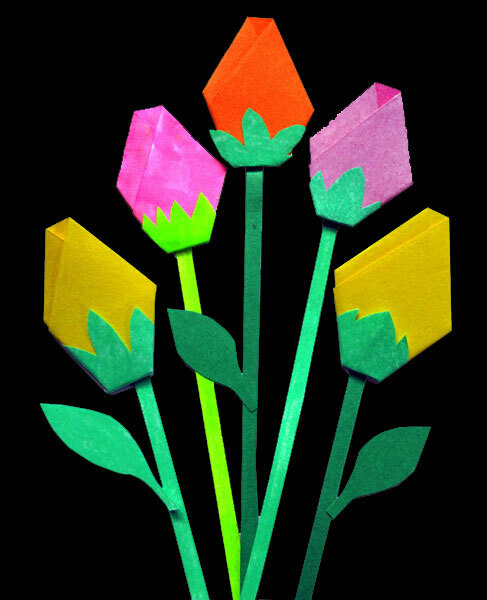 There are so many ways to make paper flowers - yet I have a hard time finding ones that are flat enough to be used on greeting cards that I want to mail. So I developed my own! 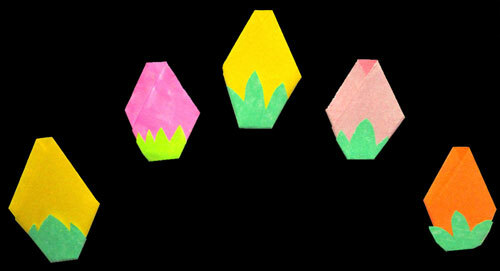 This origami rosebud requires only a few folds, and you can make 2 buds from each square of paper. I find that 2.5" squares work best for my cards; try different sizes to see what suits you. I also use different kinds of papers for this little model, origami papers as well as colored copy paper, and sometimes gift wrap. I also use white or yellow papers and customize them with colored pencils and/or markers. 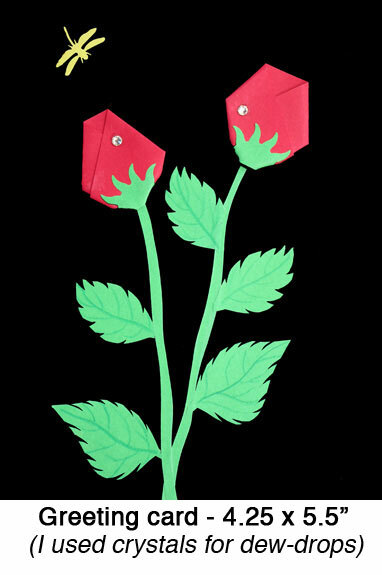 To use these rosebuds on greeting cards, I often add stems and leaves. 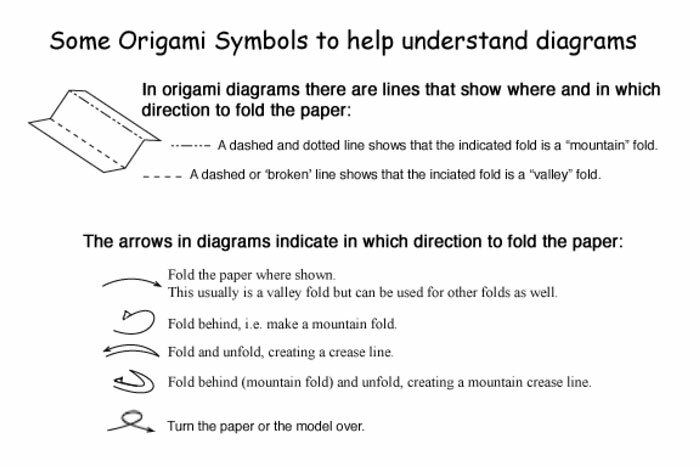 These can be cut out from colored papers or punched out using decorative paper punches. Other embellishments are fun to add; for example, I've used small crystals to represent dew drops on the flowers. If you assemble a bouquet of several rosebuds, a small ribbon bow adds a nice accent. 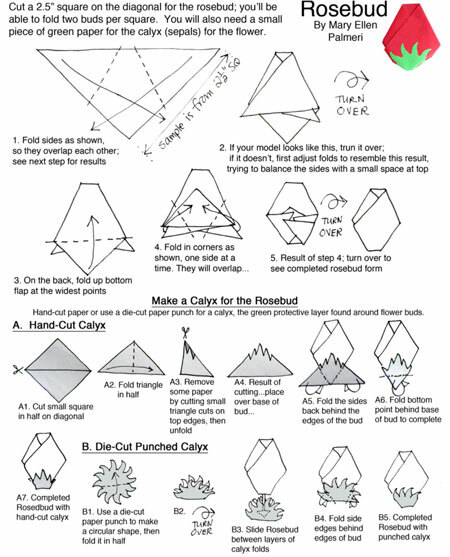 When folding this origami rosebud, don't worry if it doesn't come out exactly as you'd like the first time. Experiment with the angles and sizes of folds, and you'll come up with several that work. Also, trim off excess paper on the parts that fold to the back if it makes it easier to get good results! A little dot of white glue will hold it all together when completed.